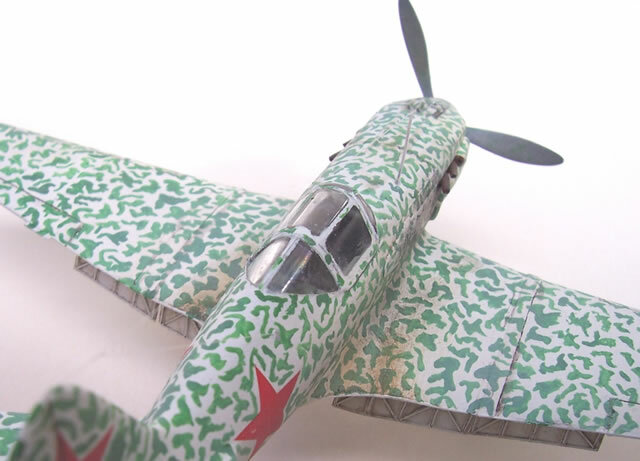 The Hobby Boss kit of the Mig-3 has been widely and favourably reviewed as being the most accurate and best 1/72 scale kit of this subject; and represents a lat production version. The most significant error appears to be the continuation of the wing join reinforcing band over the flaps, but it’s an error that’s very easily remedied. 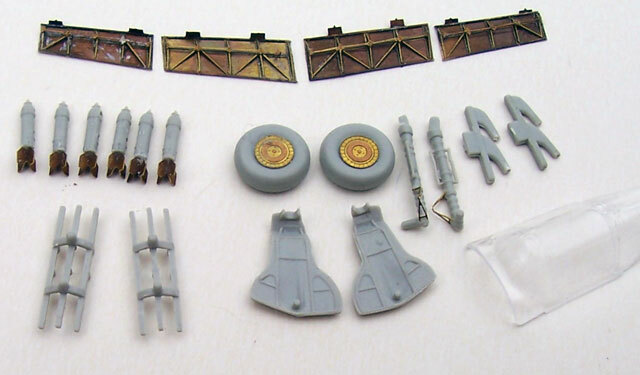 The cockpit is basic as are most 1/72 Hobby Boss kits, and like these it is designed with simple and fast assembly in mind. Fine recessed detail, a clear canopy, and nicely moulded small detail with good quality decals round the well presented package out. I should also mention that the styrene used is delightful to work with, being just right for carving and shaping (something that proved important to my build). Previous 1/72 kits of this subject include the very inaccurate Crois du Sud example that has been offered under several labels including Italeri. Mine was the Encore boxing from Squadron with the addition of some rather indifferent resin cockpit, exhaust and wing gun detail, plus good decals. The other far more accurate kit is by a Russian (?) company, possibly Alfa, and usually found boxed by RPM and Maquette. Mine was from the latter, and proved to rather crudely moulded in places with quite a bit of flash and indifferent small details. I had purchased the very nice Part photo-etch detail set for the RPM kit. 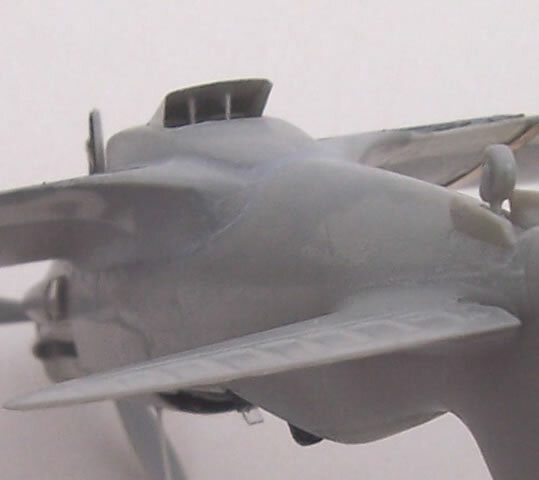 This included cockpit details, flaps, undercarriage doors, various cooler and radiator faces, rocket fins and other small details. I chose to use some of the Encore kit’s resin and almost the entire Part Photo-Etch (PE) set instead of taking the easy way out and just building the Hobby Boss kit. Why? I have no logical answer, except that the detail parts were there to be used. 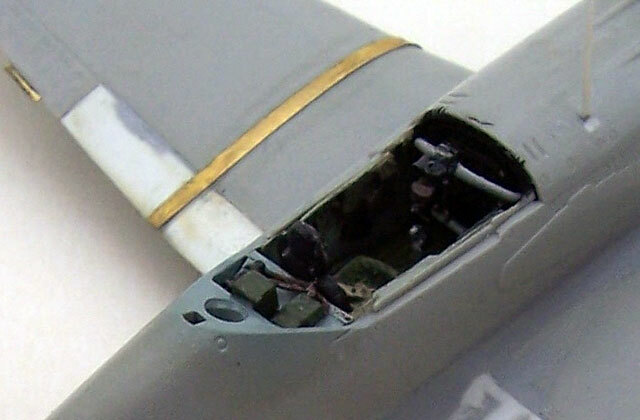 Because of what the PE set offered there were two obvious areas for modification; these being the cockpit and flaps. Other areas I chose to improve were the radiator, gun troughs, and smaller areas like oil-coolers, rocket fins and exhausts. 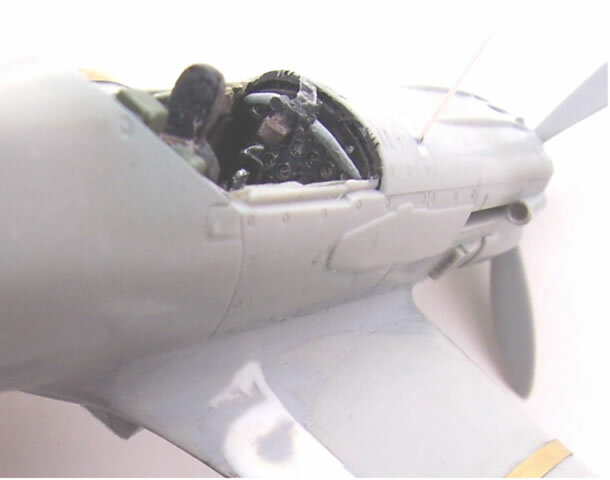 The kit cockpit is moulded integrally with the fuselage. These meant that the first task was to Dremel this area out and thin the fuselage wall down. As I mentioned earlier, the Hobby Boss plastic is really nice to trim and carve, with just the right amount of plastisizer for this task. I used the Encore kit’s resin floor, fuselage sides and seat. To these were added the PE floor detail, trip wheel, rudder pedals, seat belts and instrument panel. I scratch built a gun sight, joystick and some radio boxes behind the seat head armour. 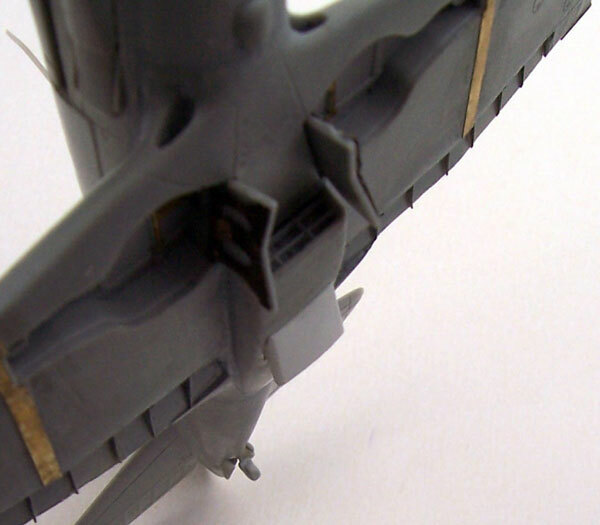 Incorporating the PE flaps into the single-piece Hobby Boss wing presented a bit of a challenge at first. I soon found that using a Dremel to remove the flaps and thin down to the top wing surface from inside was the hard way to do it. So instead I removed the flaps and the top wing covering them in one piece. I then use a couple of layers of 10-thou plastic-card to reconstruct the upper wing skin. The flaps consisted of something like 40 or more pieces each side. Such is the quality of Part’s detail set I was pleasantly surprised to find them quite easy to assemble, despite the small size of the little ribs. I decided to have the radiator’s exit flap lowered as would be the case when ground running the engine. This meant that I could use the PE radiator core. 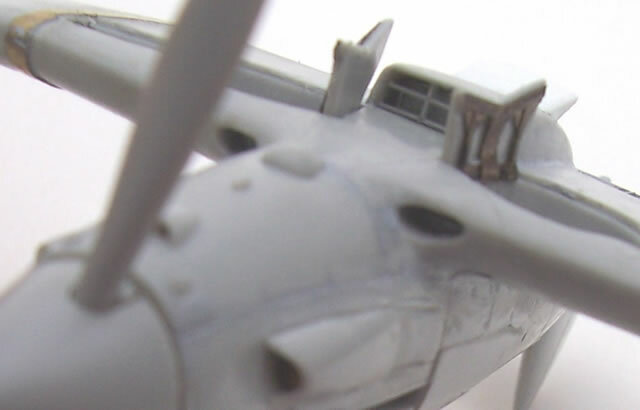 So I had to open p quite a hole in the lower centre wing for the radiator and line the exit to the radiator. The flap was made from 5 thou plastic card. I also made a small grid out of plastic card to go across the air intake of the radiator. I also improved the oil coolers by opening up the interior of the kit parts to accept photo-etch meshed faces. I did not like the way that the three machine gun troughs were represented by shallow troughs and engraved ovals. I choose to cut slots large enough to take three lengths of plastic tube which were super-glued in place. I then cut and sanded these to shape to conform with the nose contours, and in so doing reveal three troughs. I inserted until these some lengths of hypodermic needle to represent the guns’ blast tubes. 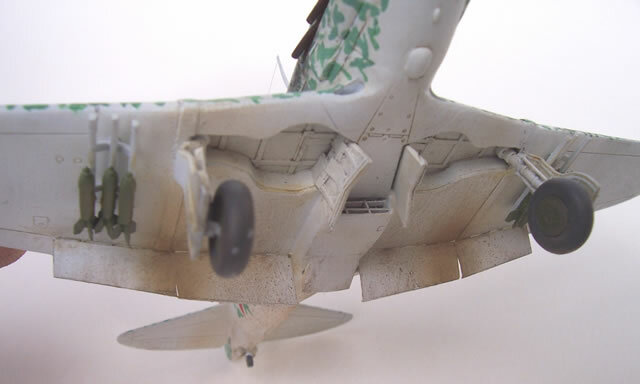 A small bump on the front of the nose was lost in sanding, and so replaced with scrap. Part supply brass wing-join reinforcing strips that have a bit more detail incorporated then the kit’s moulded representations. I therefore removed the moulded straps and glued on the brass ones. I also took the opportunity to replace the rather exaggerated and solid wingtip lights with clear plastic sanded to shape. 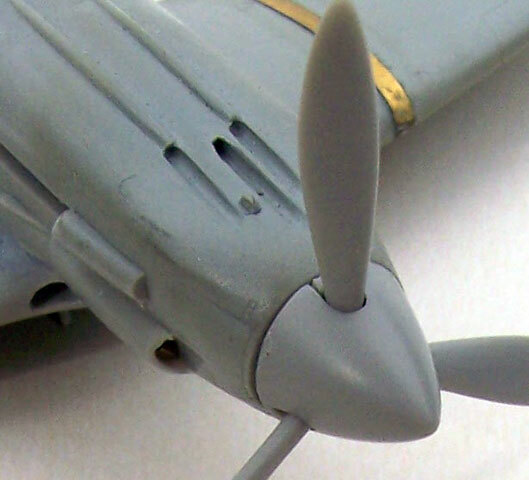 A few other modifications that spring to mind are the inclusion of the PE detail for the inside of the undercarriage doors, replacement of the well moulded kit rocket fins with even finer brass ones. I added the PE trim tab to the left wing, and wheel hubs to the kit wheels. 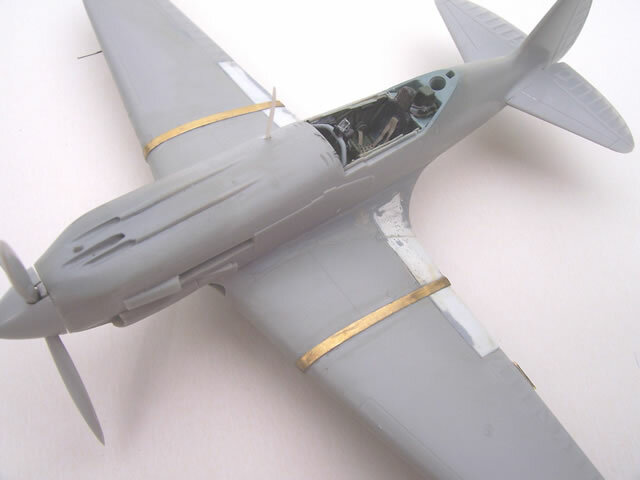 I replaced the kit aerial mast with a finer scratch-built example, drilled out the exhausts, and made a finer metal pitot than the kit’s example. 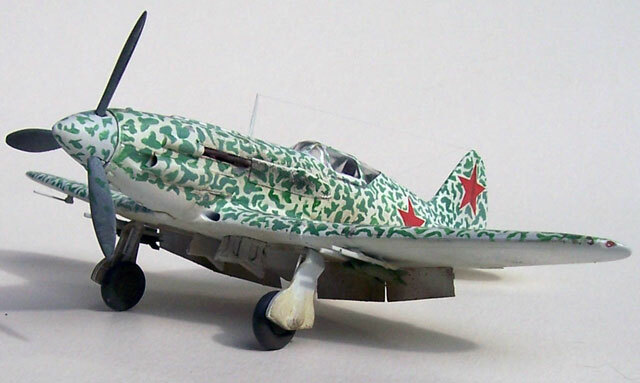 The paint scheme I chose was featured in a Squadron in Action and backed up by a photo I found at Massimo Tessitori’s superb and authoritative MiG-3 resource at http://mig3.sovietwarplanes.com/mig3/mig3.html . 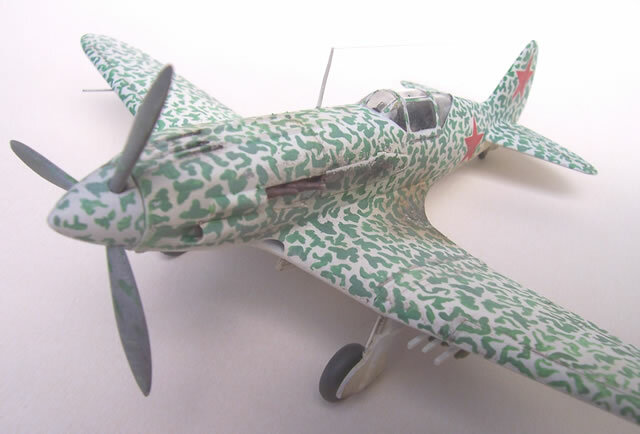 This featured a late production aircraft that had been painted white at the factory, and then had field applied green blotches overall (even the to propeller blades). I feel that my green ended up looking a bit too “minty”, but I’ll live with it. I used the kit decals and these proved to excellent in all respects. On reflection I feel that the Hobby Boss kit more or less out of the box would be just fine, but I got the benefit of making my first photo-etch flaps from this build, so that justifies the extra effort. Overall I’d rate the Hobby Boss kit as great value and simple to build.